Members are allowed to bring their own golf equipment. 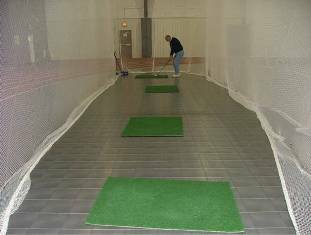 If you plan to use the golf cage during your visit, please sign up on the appropriate clipboard at the front desk. Any reservations made for the golf cage will be posted at the front desk. Reservations can be made 1-7 days in advance for a $1.00 fee to reserve the cage for one hour. Reservations can be made the day of for no fee, however, the reservation is limited to 1/2 hour only and you may only sign up for one time slot on the clipboard.